Join Hinckley & Bosworth Lib Dems. Nick Clegg MP - Leader of the Liberal Democrats. 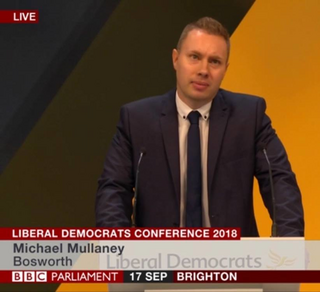 Speaking at the Annual Lib Dem conference Hinckley County Councillor Michael Mullaney called on the Tory led Leicestershire County Council to drop plans to scrap Hinckley and Bosworth and the other Boroughs in Leciestershire. Michael Mullaney said "Decision making over controversial issues such as planning developments should be taken at a local Borough level not imposed by a remote single Leicestershire authority. "One authority for Leicestershire would cover seven Boroughs and districts, an enormous area and population. One authority cannot fairly represent the huge variety of towns and villages in our county. "I believe the County Council should drop these flawed plans for one unitary authority for Leicestershire. Hinckley and Bosworth and the other local boroughs should be kept"